Car tires are vulnerable to punctures, flats, and other failures. If you see underinflation, overinflation, or uneven tire wear, get it it inspected. It's common to see cars on the side of the road when you drive down any interstate or highway. More often than not, it has a flat tire or a jack holding the car up with a wheel off. As you drive by, you think how awful it must be to be that person, but safe driving is often taken for granted. How often do you visually inspect your tires? Probably not as often as you should. Do you know what you're looking for? Many of the flat tires at the side of the road could be avoided with a little tire knowledge. Here are 10 Tire Safety Issues every car owner should know. That includes short distances. Your car is designed to be driven when the tires are inflated to their proper pressure. If your tires are flat, not only will the tire be destroyed when you drive on it, but your car will not act the same way in driving conditions. Every bump and groove will feel like the steering wheel is being yanked out of your hands, and braking control is compromised. You may experience unwanted antilock brake activation as well. Avoid it at all costs unless you need to get out of a dangerous situation. There is a segment of the population that increases the tire pressures to reduce rolling resistance with the road, which increases fuel efficiency slightly. It is not an advised practice because the flat contact patch balloons out slightly. Only the center part of the tread makes contact with the road, wearing out the center section quicker. Not only does this reduce traction on the road, but if an overinflated tire impacts a pothole, curb, or foreign object on the road, it can burst much easier than properly inflated tires. Under-inflating tires isn’t common practice, however the air pressure in your tires fluctuates due to the temperature changes outside. This can be as much as 8 psi between summer and winter in cold climates. When you drive on under-inflated tire, not only do you experience a decrease in fuel efficiency but there are safety implications as well. 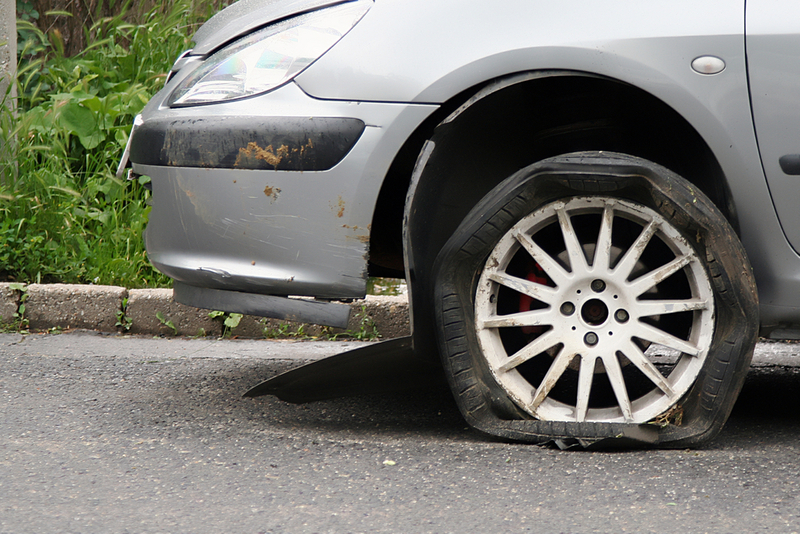 An under-inflated tire can pinch and pop easier on a sudden impact with a curb or pothole and cause a blowout or leak. Tire pressures should be checked and adjusted during season changes to avoid potential safety related problems. When you see tires wearing unevenly, whether one of the four tires is wearing more than the rest or there are unusual wear patterns on an individual tire, it signals a potentially unsafe problem with your vehicle. Uneven tire wear can be an indication of a separated belt on a tire, or it can be a symptom of a steering or suspension problem on your vehicle. The load range of your tires is matched to your vehicle’s abilities and your usage. If you have tires that aren’t rated heavy enough for your usage, you can experience a plethora of tire-related symptoms like abnormal wear, blowouts, and tire separation. This usually applies more to vehicles that tow or to trucks, but needless to say, it’s not safe. It isn’t safe to drive on worn out tires. They are susceptible to blowouts, can’t be repaired, but most importantly, worn out tires don’t have traction. While braking, steering, and acceleration, tires need to have traction for effective operation. Worn out tires will cause your vehicle to slide on slippery surfaces and hydroplane in wet conditions. Everyone knows that person who drives on their spare tire for extended distances or lengths of time. Compact spare tires are designed for very short term use at speeds under 50 miles per hour at distances up to 50 miles. Daily operation on your compact spare does two things: it puts you at risk of another flat tire if your compact spare is damaged or wears out, and it means you are driving your car without a spare tire. The transfer cases on these vehicles will experience binding and potentially harmful tension if unmatched tire sizes are used. This also includes tires with varying tread depths. Tires with as little as half an inch difference in diameter can cause symptoms or failure that can potentially be unsafe. The Department of Transportation deems a proper tire repair to be a combination of a plug and a patch for a puncture up to ¼ inch. Holes bigger than that, and repairs aside from the combination plug-patch aren’t allowed because of their safety implications. Also, a tire cannot be patched on the sidewall or on the rounded shoulder of the tire. All of these things can lead to a sudden loss of tire pressure. When you walk up to your car and the metallic glimmer of a screw or nail in your tire catches your eye, it can cause that sinking feeling. But don’t lose hope yet. The tread on your tires is about ⅜ of an inch thick when new. Add to that the thickness of the inner and structural layers, and your tire is nearly an inch thick. Plenty of screws, nails, staples and tacks are shorter than that and won’t penetrate all the way through to cause an air leak. You’ll want to be sure it doesn’t leak when removed though, so having a tire repair shop remove it is probably a good idea. Driving safely is paramount, more so than vehicle performance. If you have any concerns about your tire condition or are unsure if they are safe to use, connect with a tire expert. Q: How do I use lane change assist?